Strange Fruit will never quite sound the same again. American cinema hasn’t focussed much on the most sordid chapter in their history, but we have encountered all of this — the cotton plantations, the blood, the evil slavers and the put-upon hero full to the brim with honest-to-Gawd nobility — very recently indeed with Quentin Tarantino’s last film, one that took that alarming backdrop and turned it, preposterously enough, into something resembling a Spaghetti Western. McQueen, a British filmmaker often as audacious with his own methods, chooses here to approach Solomon Northup’s eponymous memoir with theatrical classicism. The result, then, is Django Unchained by way of Shyam Benegal. It doesn’t flinch, it doesn’t let up, and — perhaps disappointingly, for those expecting the McQueen flavour — it doesn’t surprise. What works in favour of the film are the performances. 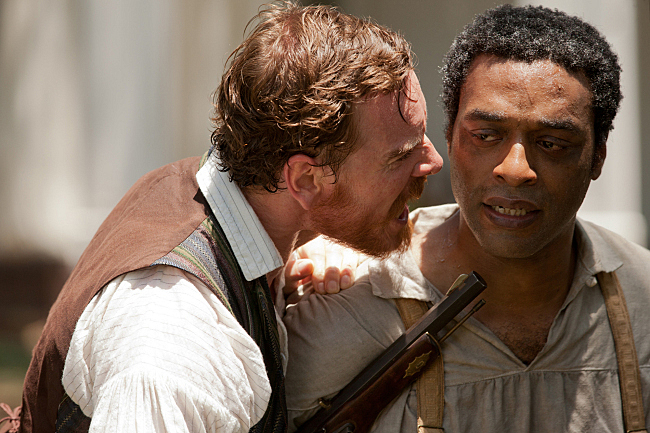 Chiwetel Ejiofor is extraordinary as Solomon Northup, a free black man kidnapped into slavery, confounded and determined and frequently driven to despair by his impossible yet tragically common situation. Paul Giamatti makes hackles rise as he sells off human livestock with uncaring professionalism, and Benedict Cumberbatch does well as a slaver with half a conscience. The performance pitted directly opposite Ejiofor is that of McQueen regular Michael Fassbender, playing a demented white maniac slaver with as much glee as Leonardo DiCaprio in Quentin’s film; except he plays it with more realistic menace. He’s scarily good. Lupita Nyong’o shines as Patsey, a frequently abused labourer desperate for a bar of soap, and Alfre Woodard — as a former slave now married to a plantation owner — provides the film’s most intriguing character. Patsey might not have herself a bar of soap, but when she’s sitting at Mistress Shaw’s ornate table, she’s allowed a macaroon. And while it is a fine ensemble, it is surprising to see this much reliance on the familiar. Besides the names already mentioned, there’s Paul Dano as an evil overseer, Beasts Of The Southern Wild stars Quvenzhane Wallis and Dwight Henry in small roles, and — in the film’s most fatal misstep — producer Brad Pitt playing the one upstanding white man who does the right thing. 12 Years A Slave is gorgeously shot by McQueen’s lensman Sean Bobbitt, with visuals that will remain etched in our imaginations. It’s also a wonderfully paced film, brisk despite its uncompromising brutality, a film that doesn’t feel a dozen years long. Perhaps this is not as it should be. Either way, I do wish McQueen hadn’t gotten Hans Zimmer to do the music score; it makes the film feel all Amistad-y. At the end of the film — spoiler alert to all those who don’t know what the film is called, I guess — and before the credits, white text on a dark background spells out what happened to Northup after his twelve years. About his life, his appeals to the judiciary, his book and the way he supported the underground resistance as a free man. He might well have found his spirit in the dozen years he — and McQueen — have told us about, but I can’t help shake the feeling McQueen picked the wrong end of the story to film.